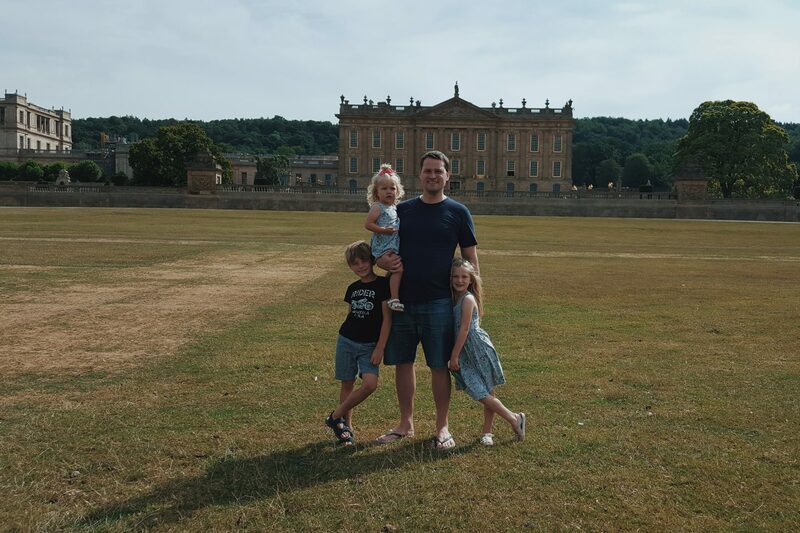 On Saturday, after camping over for the night just outside of Bakewell in the Peak District, we enjoyed a wonderful family day out at Chatsworth House. 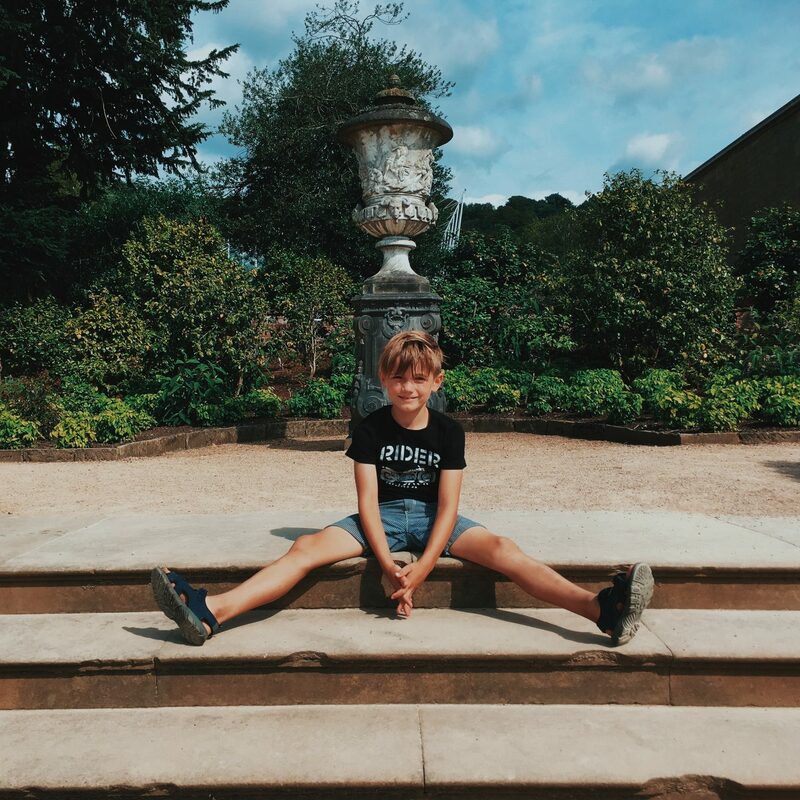 I have wanted to visit for such a long time (since first seeing Pride and Prejudice) and have known since then that if I went to Chatsworth house, I would simply love it (and I did)! 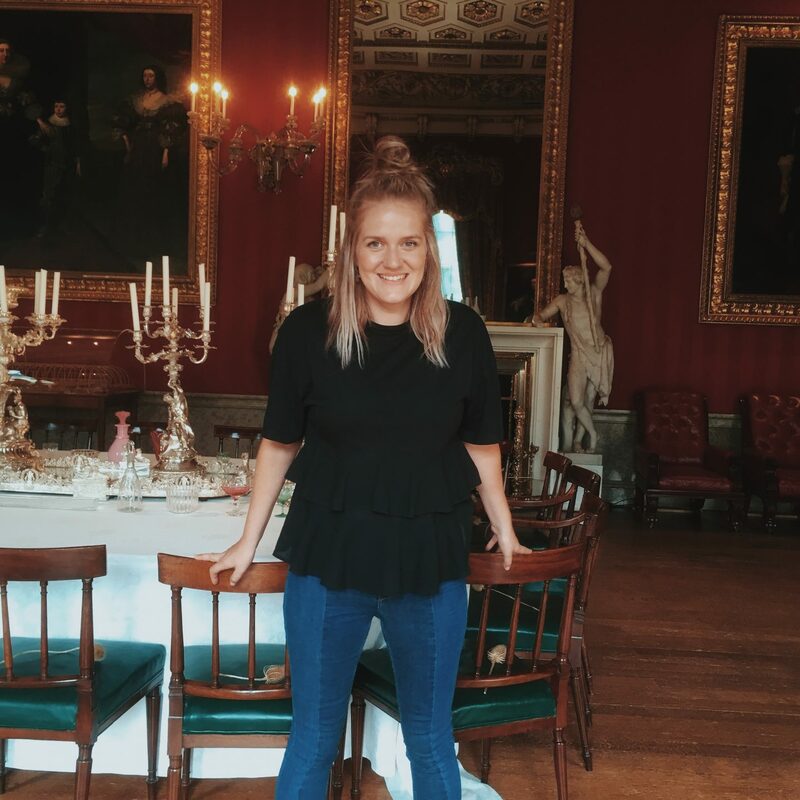 This post however, isn’t about how much I loved it – that’s a given as I have such a fondness for stately homes! 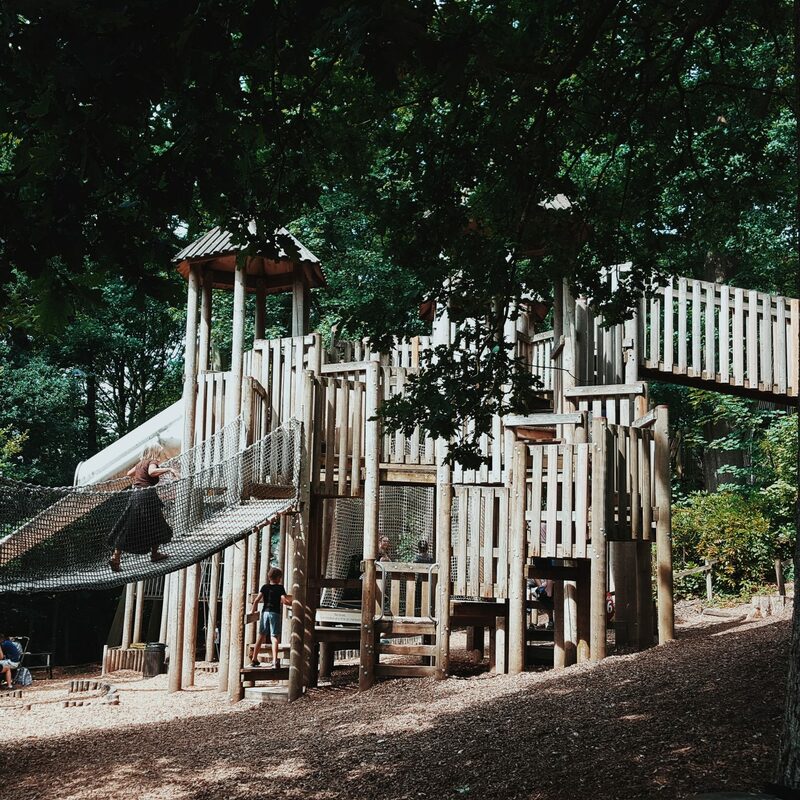 No, this post is a review on how much I loved it as a location for a family day out and how it was to visit with kids. And, in that regard I can already tell you that it was great – we had a lovely day! 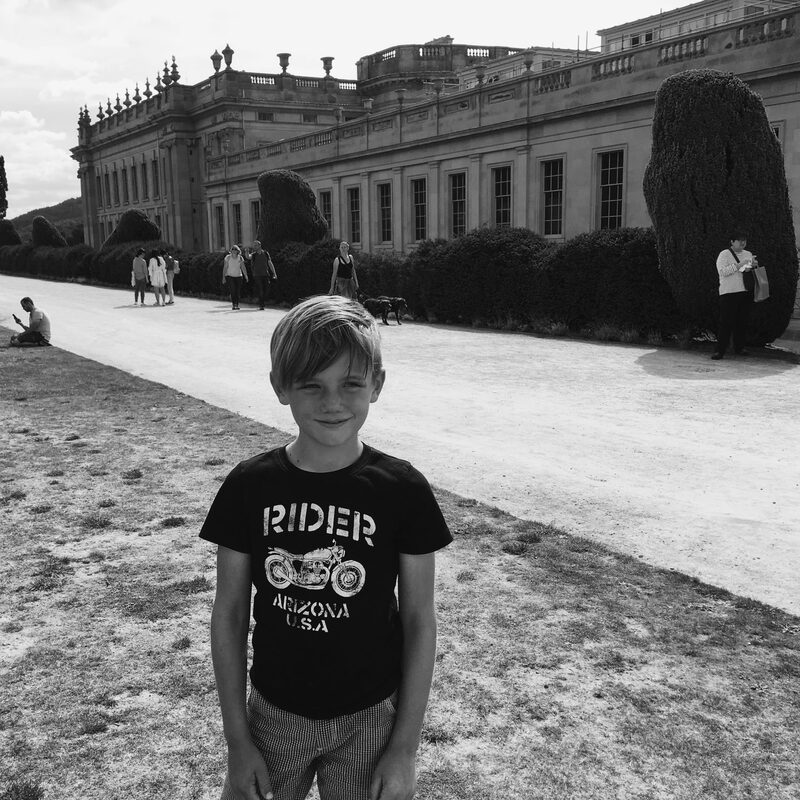 Chatsworth house has an incredible history. It is currently home to the Duke and Duchess of Devonshire and has been passed down through 16 generations of the Cavendish family. The house is open to the public, but you only walk around a portion of it – which is enough to appreciate its history and grandeur. 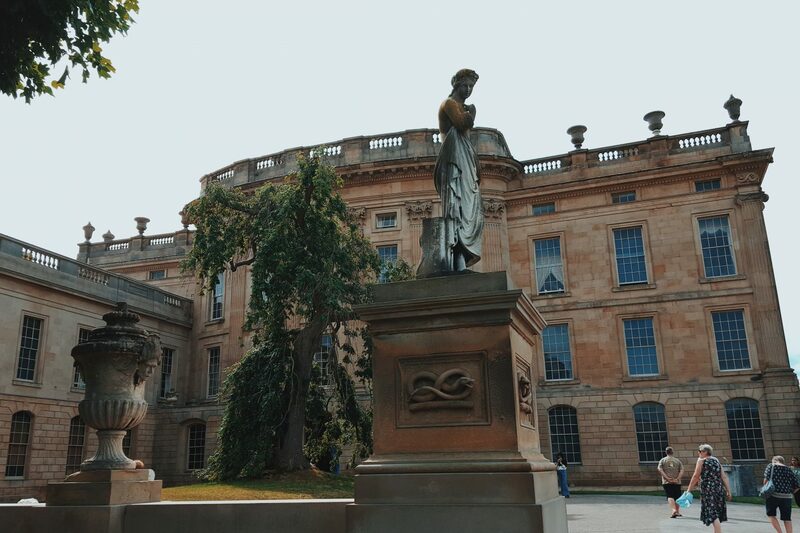 It took us about 90 mins or maybe more to take a tour, which led us through the main hall, gallery’s, bedrooms, Library, dining room, hallways and staircase. It is impressive as soon as you enter the gates and the kids loved the architecture and majesty of the house. 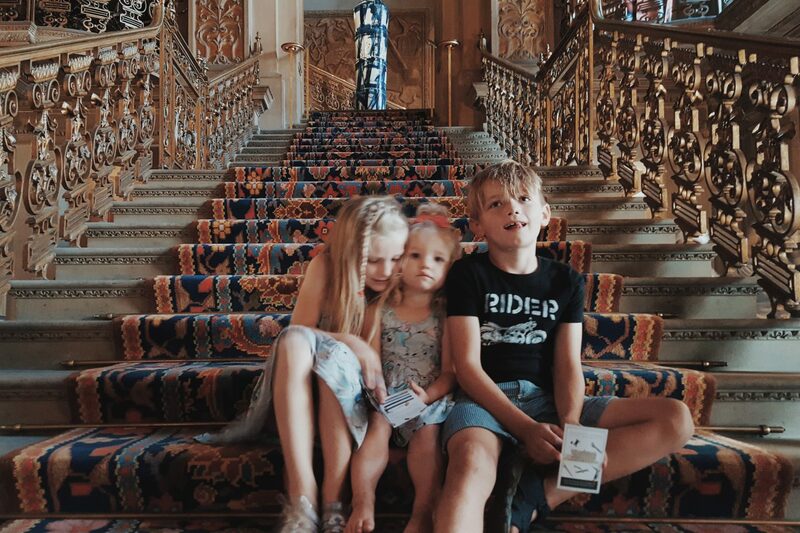 They noticed the statues and small carvings in the stone, were interested in how it was made, and then once inside loved looking around at the grand ceilings, staircase and rooms. 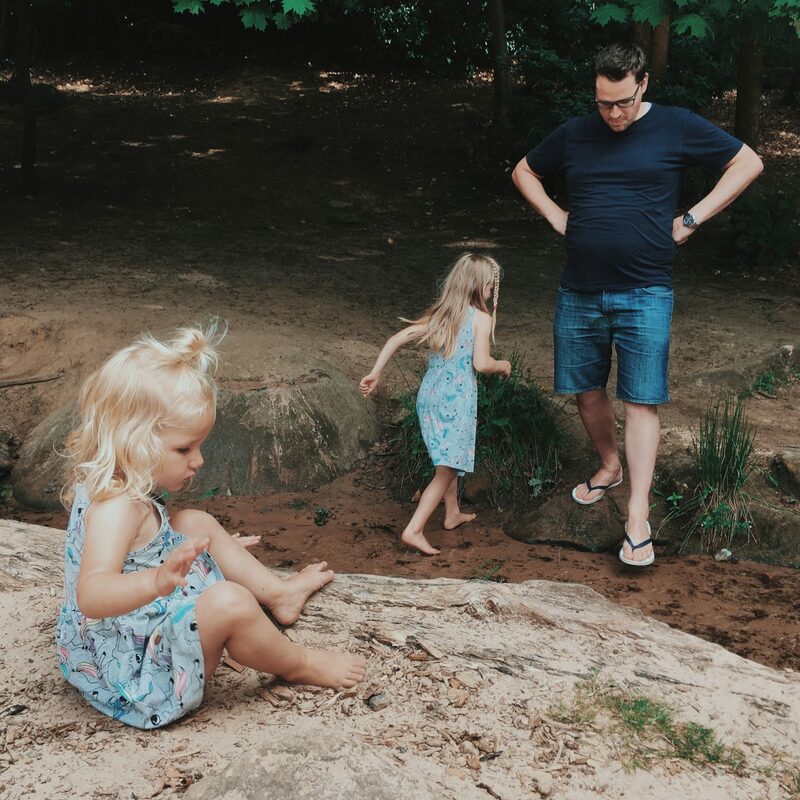 I love visiting places like this with the kids because they always notice and find fascination in things we tend to overlook. And it was these small things that made the visit more enjoyable, interesting and exciting for them too. 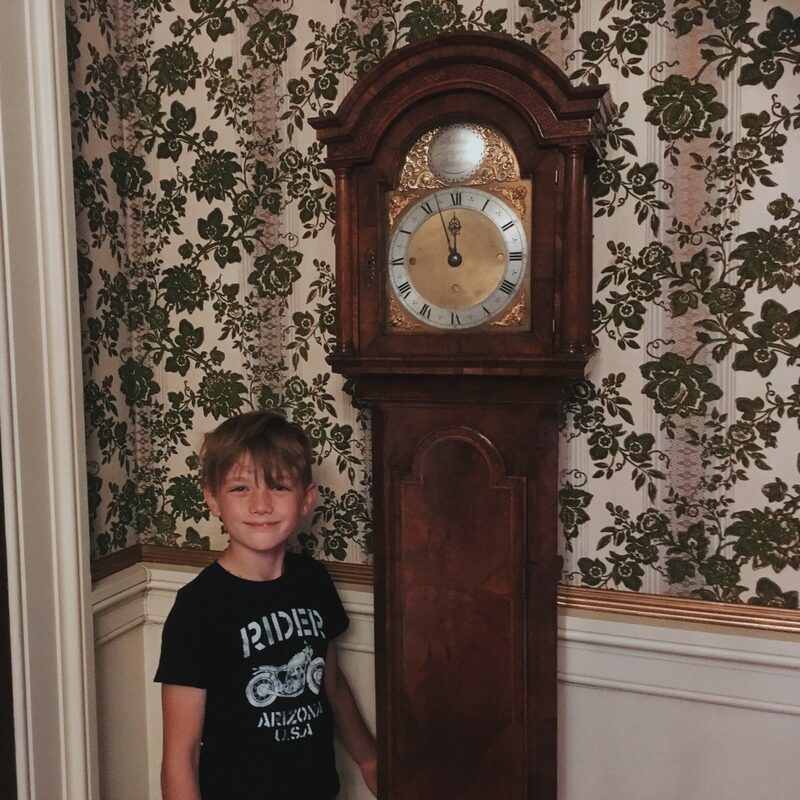 For Ethan it was the grandfather clock in the corner of a hallways that people rushed passed, and a small set of cutlery in a case in front of the piano, that contained so much detail that he said it “was so fancy”! 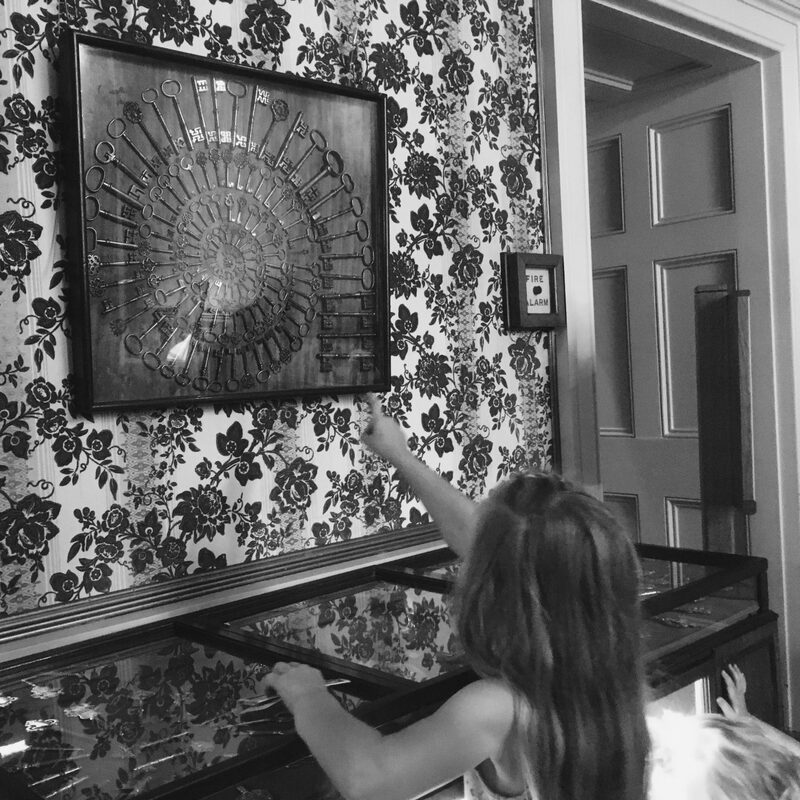 Megan on the other hand took great interest in the key art and stood for ages looking at the intricate details of the various keys. 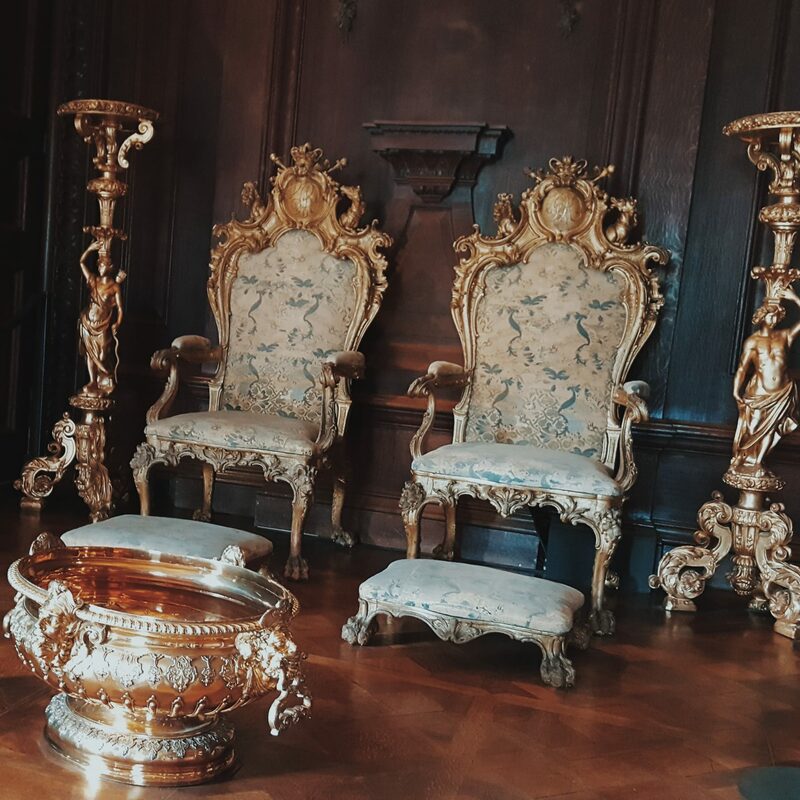 She also enjoyed walking the stairs like a queen and seeing the thrones that were given to the family from the monarchy. 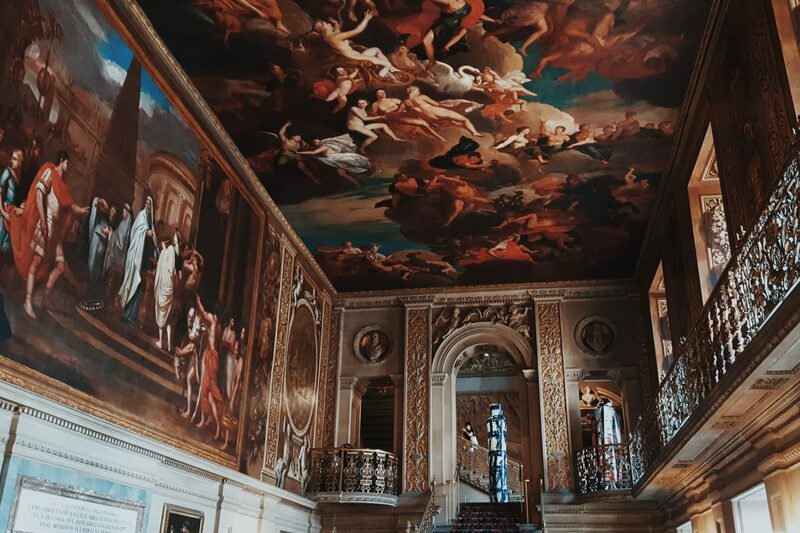 We all loved the ceiling paintings which adorned most rooms, and hearing the amazing stories from those who worked there – like the one about the bed that Charles II was placed in after his death (would you stay there?! 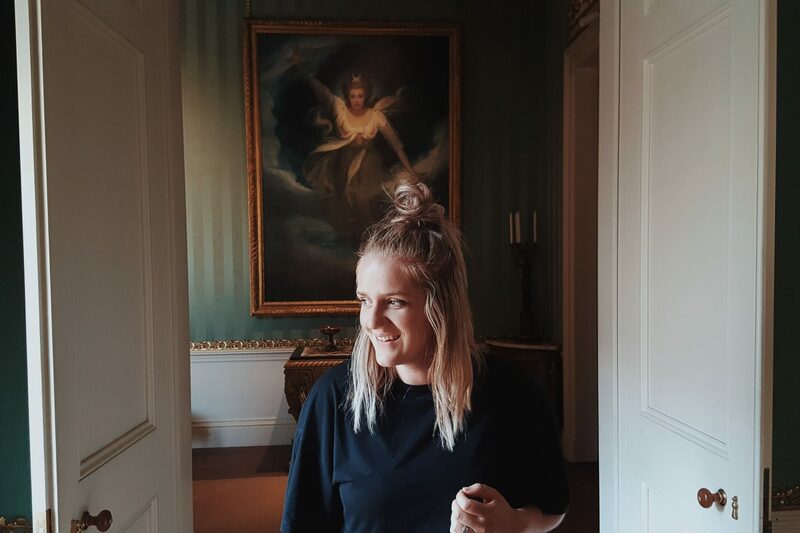 ), and the one about how they found all of the signatures of the people that worked in the house on the walls when they started renovating ( 2 of many that make it such an exciting place to spend some time)! 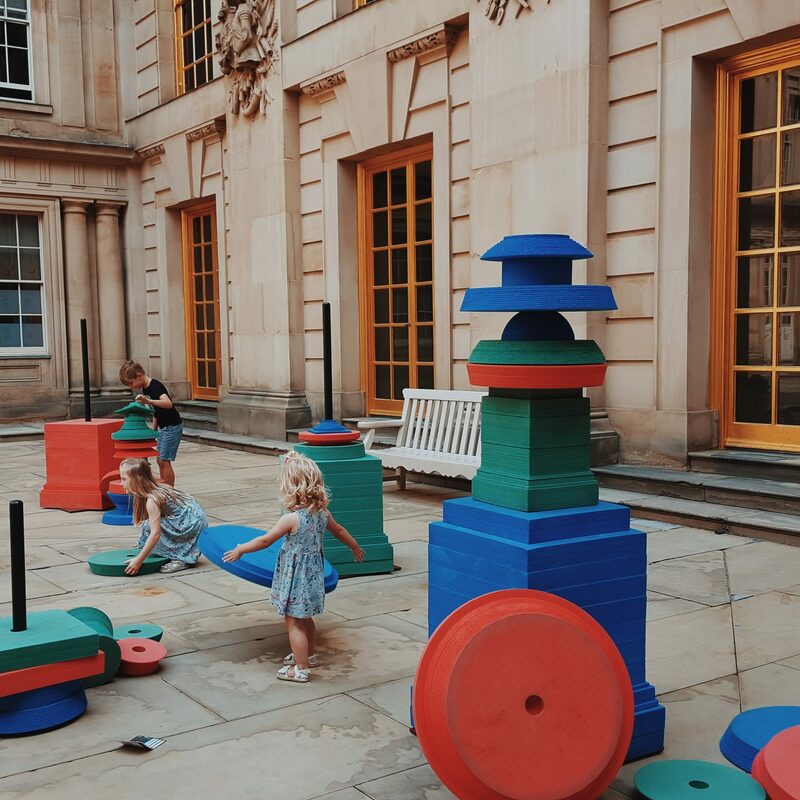 The kids also spent a lot of time in the courtyard where they also have a fun foam building activity that helps them recreate some of the pottery they have seen in the house. They liked this part, and we enjoyed sitting out by the fountain and observing! The House caters really well for kids – the staff are lovely and were eager to chat to them and help history come alive. Our kids enjoyed these little nuggets of information, as well as looking at the information cards in each room and going around to find out what they needed to know about the different people from history (that had some kind of influence), in order to collect all of the pocket cards that they have which is part of the experience for kids! It is a beautiful, extremely interesting and exciting place to visit as a family! * Please note that Chatsworth do not allow prams, pushchairs or rucksack style baby carriers in the house! 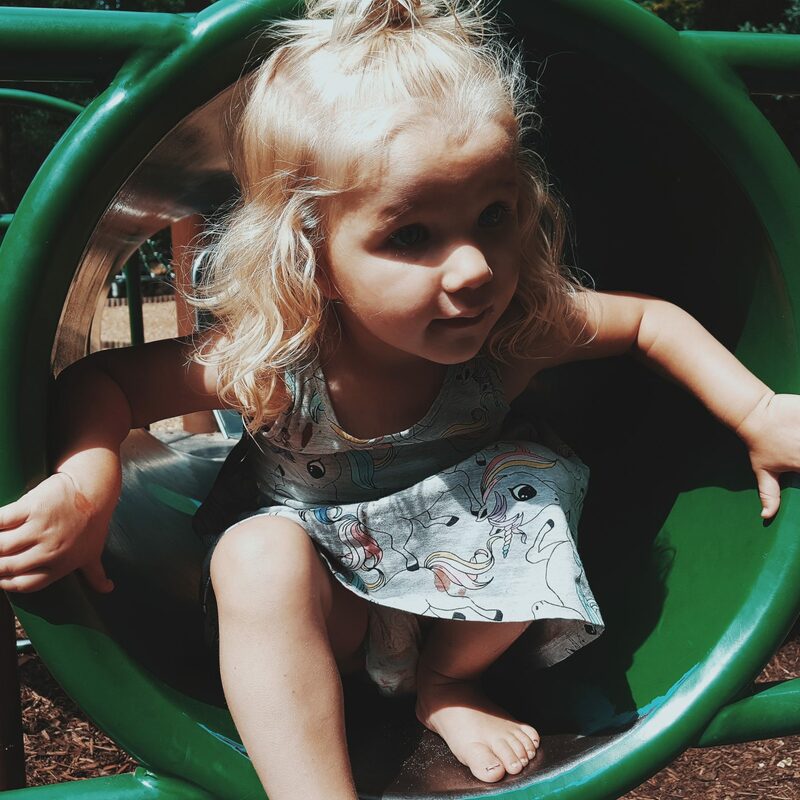 We didn’t spend a lot of time in the gardens/park itself – it was a very hot day and the kids were eager to get up to the farm and have lunch. I am a little disappointed as they have very beautiful landscaping and statues that would be wonderful for any kid (or adult) to explore. 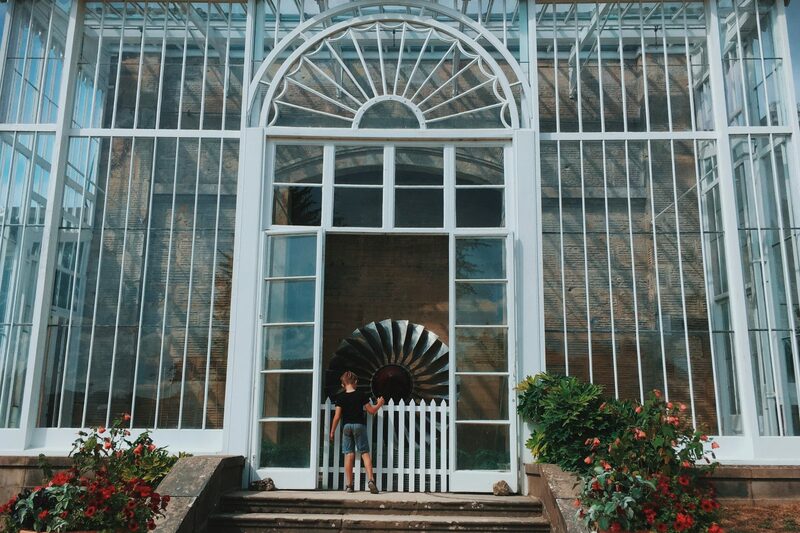 Later on though, Ethan and I returned to explore the green houses, a place he was eager to see! 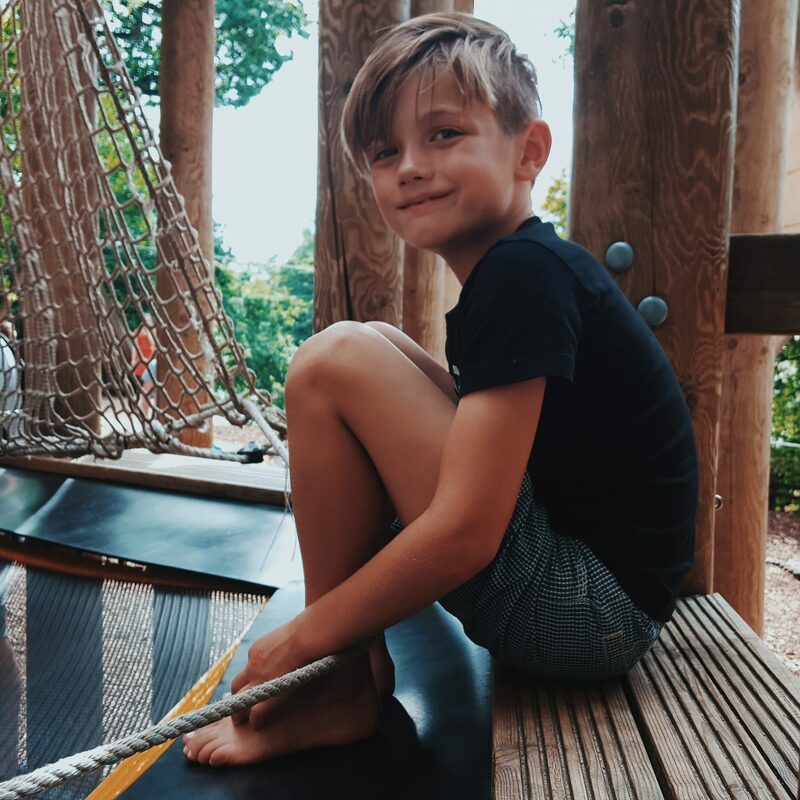 He is a budding gardener with his Grandma and enjoys looking at plants and how things work and the green houses were most impressive and certainly a little piece of adventure for him. I enjoyed exploring this tranquil part of the estate with my biggest boy and we both were impressed! The farm was lovely and all of the animals were well cared for and happy. They have goats, pigs, horses and donkeys, sheep, cows, rabbits and guinea pigs and chickens. Whilst we were there they also had some newly born chicks and piglets; both of which were absolutely adorable and very exciting for the kids! 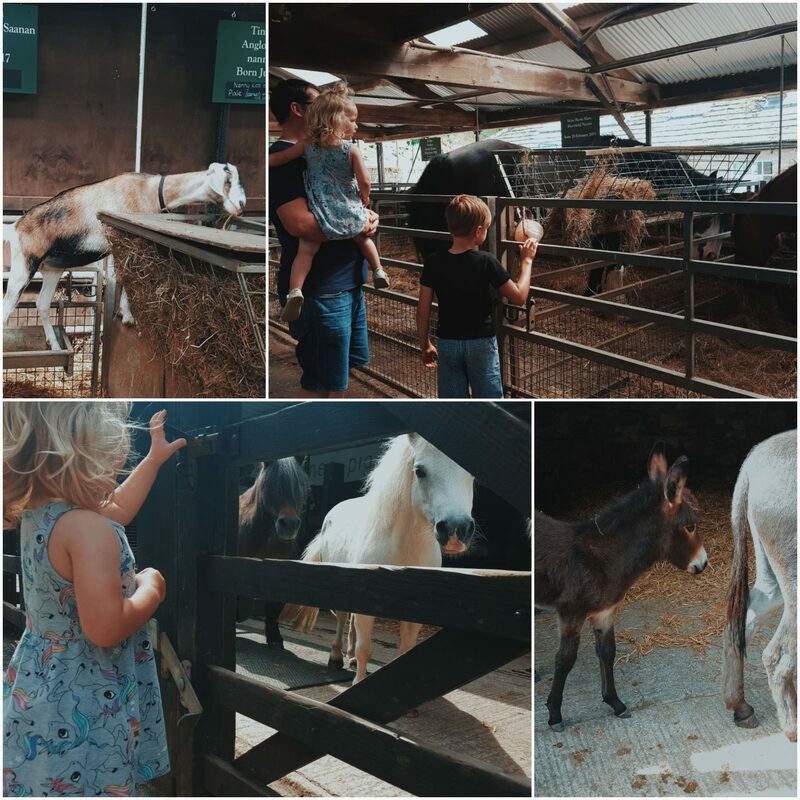 The farm really caters for little visitors, with a vintage tractor to climb on, to a tractor land for under 6’s and tractor tours for a couple of pounds! They have regular petting sessions in the Oak barn (like every 20-30 mins) and an opportunity to go into Guinea pig town and sit with the guinea pigs! It is a small farm but very happening! 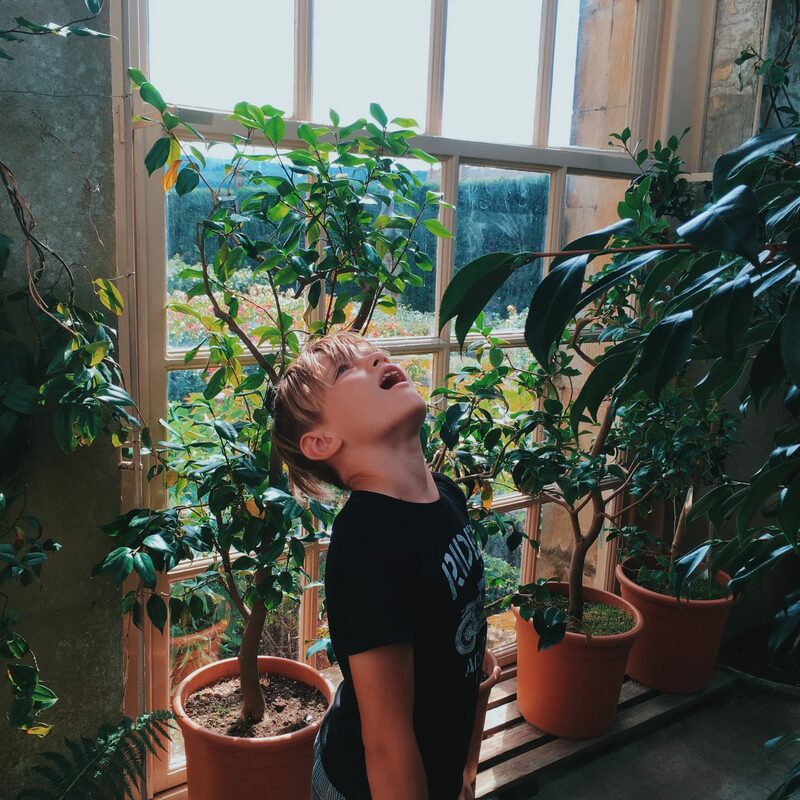 You have to pay entry to the farm to access the playground and a family ticket for both of these costs £23, which is for 2 adults and 3 kids (thank you Chatsworth for being aware that some families have more than 2 kids!). Having had visited and seen all they have, I find this a really reasonable price for a family day out. 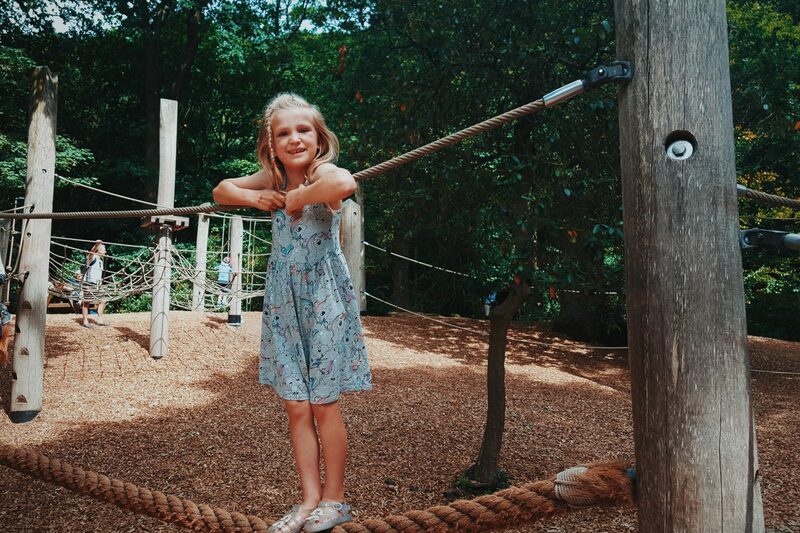 Obviously if you choose to do the house and gardens, as well as the farm and playground, then you are looking at £65 for a family ticket (again 2 adults and 3 kids). Either way the farm and playground alone would make for a fantastic day out with a picnic. The playground was definitely a favourite and was very welcomed by the kids after a morning around the house. It is unbelievable and was fantastic for them to run, jump and climb on after being so sensible! I was impressed by the size of it and how well planned out it was. 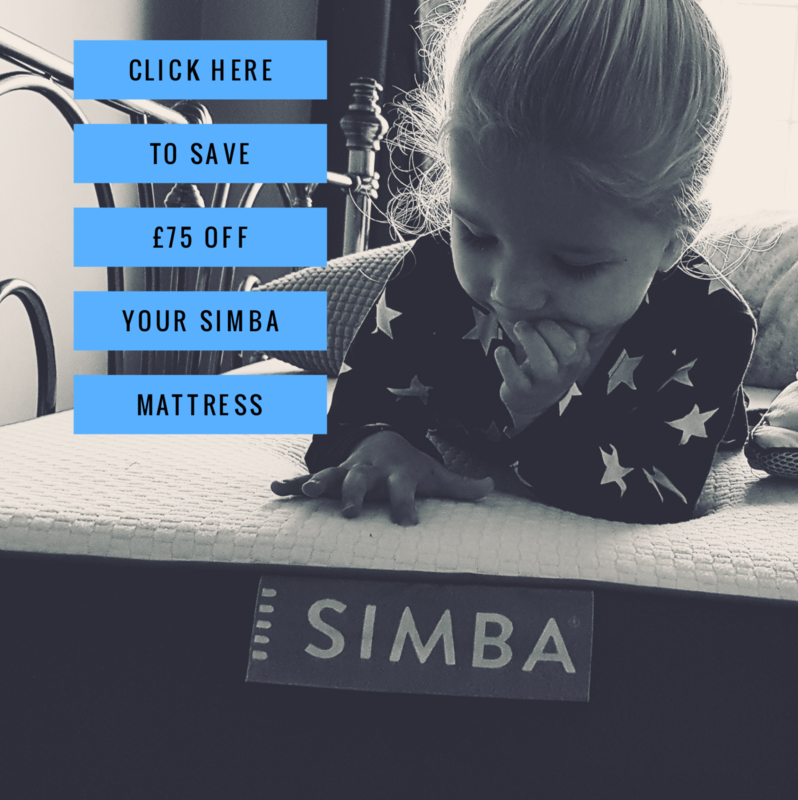 It easily caters for tiny tots right up to young teens and has so many amazing things to it – you have to see it to believe it! 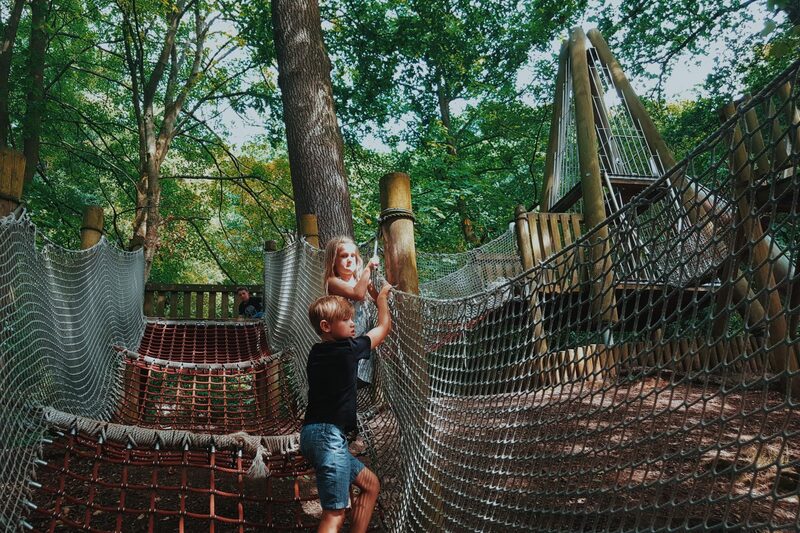 They have ropes and rope bridges, they have courses through the woods, multilevel frames that are mega high and teeny frames for the little ones. There is a trampoline and lots of slides. 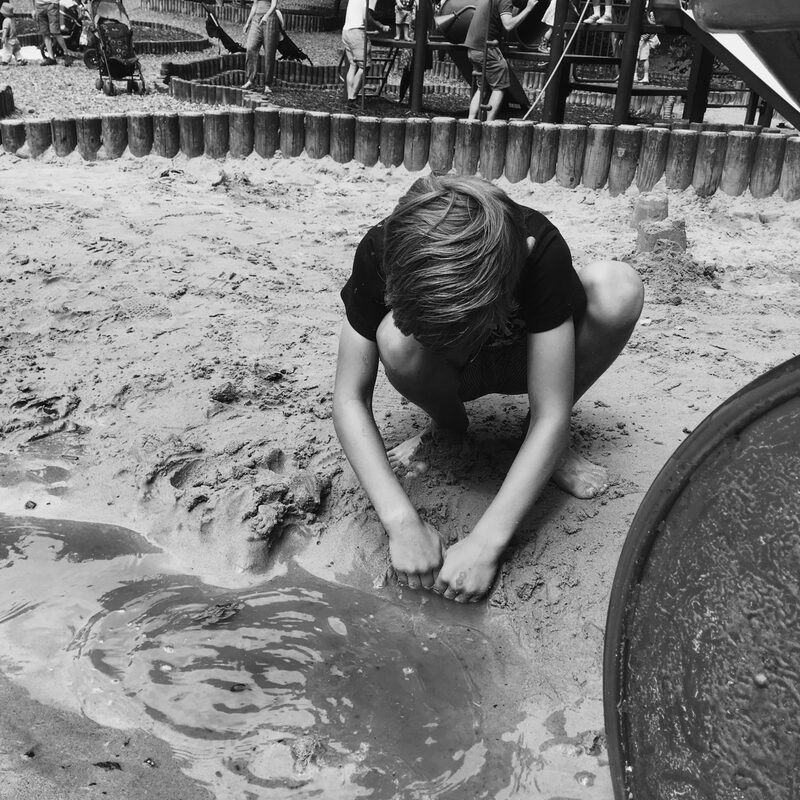 We loved the sand and water area and the kids spent a chunk of time in there building with the sand and drawing water from the stream. The weather was lush and it was a beautiful part of the grounds that catered so well for younger visitors. 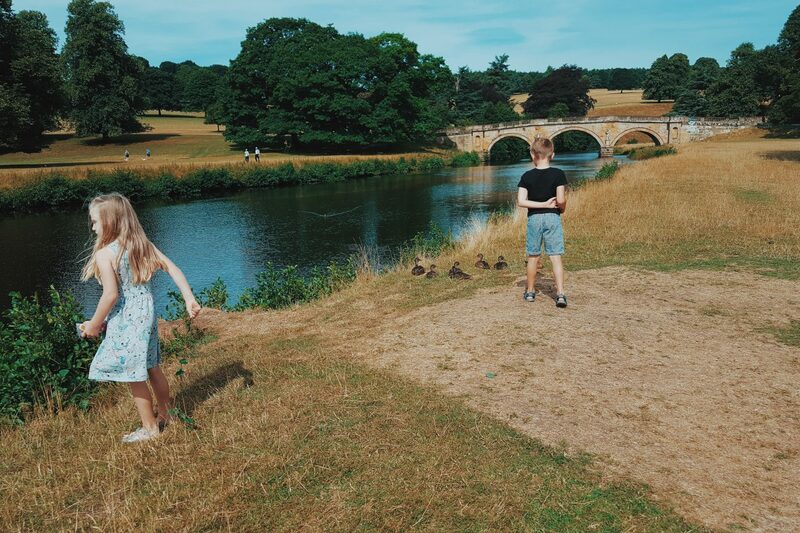 I thinks its great that you can go to Chatsworth for the day and take the kids just to the farm and playground and that in itself would fill a whole day too! There is a great array of food available at Chatsworth (and some rather classy dishes too!). They have a snack bar in the grounds of the house, 2 restaurants near the gift shop, and a cafe in the farm. They have a wide range on offer (including lots of local produce) and a kids lunch bag is £5 (you can choose 4 items – A sandwich, Drink, Crisps, Fruit or Yogurt). They also sell Ice creams in all of these places, as well as in the gift shops too. I personally would stick to taking a picnic. They have several lovely assigned areas where you can eat it and as we were so busy with so much to see, it would have been cheaper and way more convenient to just nibble as we went or set up at a table in the playground so they could graze all afternoon whilst they play! 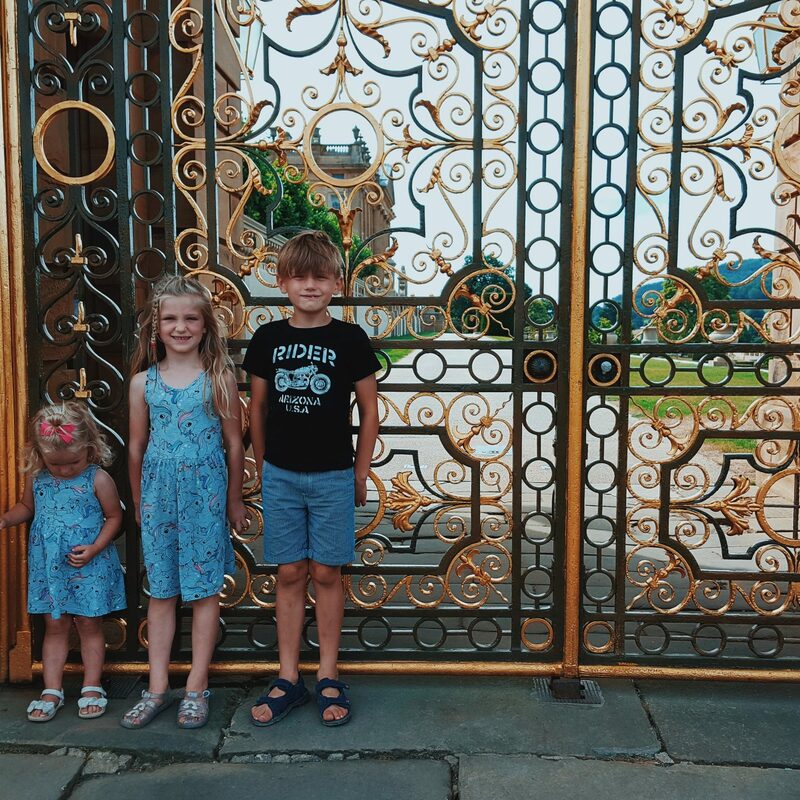 I think sometimes as parents we may look at the grandeur of a place like Chatsworth House and feel like taking our wild little ones wouldn’t be the best place or more stress than its worth to give them a cultural and historical experience. But having been with my 3 this last weekend, I cannot tell you enough what a great location it is for a family day out. It is full of wide open spaces, a house that becomes a treasure trove for kids – building imagination and takesing them into a different world. The whole place helps them appreciate history and offers a fun family adventure in the farm, gardens and playground. If you are looking for somewhere special to take the kids this Summer then this would be first on my list! If you would like to plan a visit this Summer, then click here to see what they have on! I really want to take them back again – perhaps when they are slightly older and don’t tire so easily in the heat! We didn’t see all we wanted to and even then we were there for the whole day! I also want to go back to Chatsworth for the house and Gardens at Christmas time for myself. I have seen pictures and heard about it from friends and it looks incredible. I want to go without kids so that I can stroll round the Christmas market they have and do some shopping, as well as taking my time in the house to notice all of the festive details. But yes, we will definitely go back again as a family. 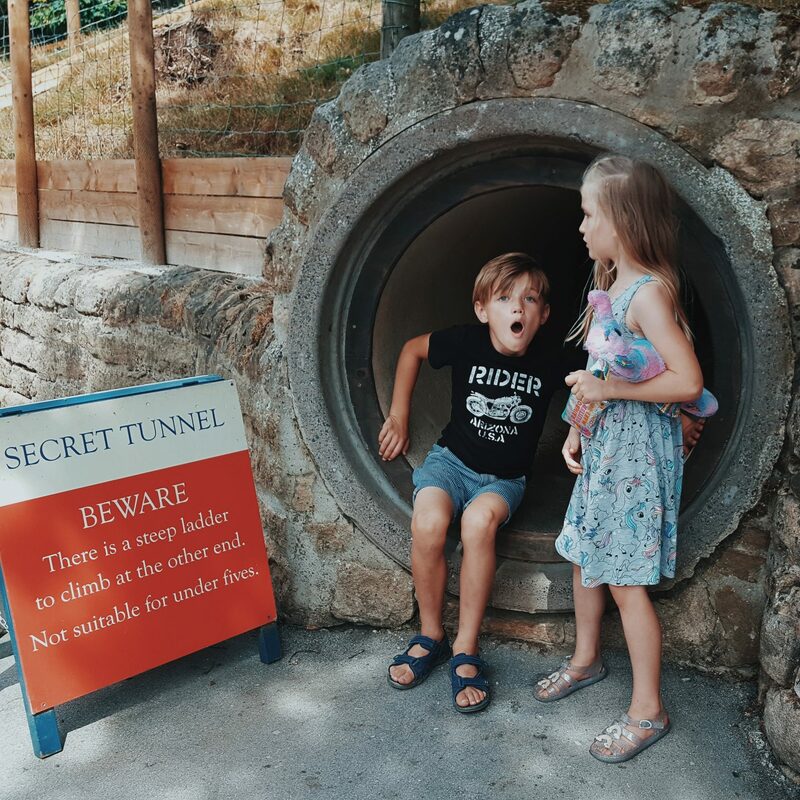 If you are looking for an exciting adventure filled with outdoor fun and animals, a bit of history and imagination, then you should totally check it out this Summer. Its popular and a little busy but it was also totally fine. We spent 6 hours there and only left because we were so tired! But it gets 2 thumbs up from us all! *We received complimentary tickets for the purpose of this review! Our visit was fantastic and all images and thoughts are our own! Thanks to Chatsworth for a wonderful family day out.